Well, I had a lovely sunny day for my Corfu reading workshop. What with the sun, the Greek music and the Greek food, it was all very… Greek. It was great fun hearing about other people’s experiences of reading the Durrell brothers – and not only the Corfu books. I am inspired to do battle with some of Lawrence’s particularly difficult novels again. Maybe this time I’ll reach the end. If you’ve followed this blog for a long time, you’ll know that I almost missed one of my own events a couple of years ago, arriving with about 38 seconds to spare. Not surprisingly, I decided that was never happening again, and this year, with so much on, I have been particularly neurotic. I have a big spreadsheet that has been checked by Husband and Elder Child, to make sure history doesn’t repeat itself. And so it was, gentle reader, that I set out in lots of time, fully clothed, and with all my notes and books, to chair the Forensics event on Friday. Got on the bus, got off the bus, went to put my umbrella away in the bag with my notes and books… Yep; still on the bus. Run (not easy in Birkenstocks) along Princes Street like a madwoman, yelling ‘Please stop!’ Catch up with bus at stop. Can see my bag on back seat. Hammer on bus window. Bus moves off. Run after bus. Am never going to catch it unless the wheels fall off. See taxi with For Hire sign – incredibly – lit. Hail taxi. Throw self into taxi. Driver eventually wipes tears of laughter from eyes and does, indeed, follow that bus. Do not catch up at next stop (George St). Do catch up at second one (York Pl). Try to open door – but taxi has not completely halted, so only succeed in engaging child lock. Wait, fuming, for magic click noise of lock disengaging. Throw self from taxi. Bus moves off. I promise I will, with interest. But a thousand Thankyous, nicest, kindest tourist in the city. And Thankyou, lovely taxi driver. And Thankyou, Book Festival staff in the yurt, for calming me down before you all fell over howling with laughter. As did Val McDermid. As did Niamh Nic Daeid. I only did it to calm their nerves. Honest. 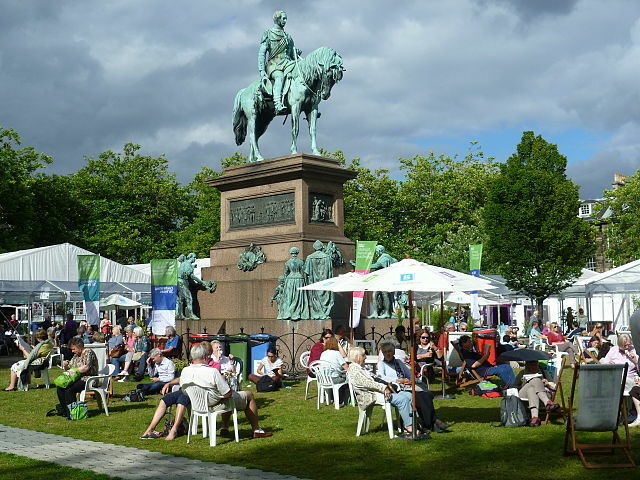 « Book Fest Blog #2: … and the sun’s still there – mostly. Oh my stars – what WILL you do next year?!?!? Glad you survived this one! Who can tell? Certainly not me. The world waits, with bated breath… Frankly, I’m surprised they still let me into the Book Festival at all!